Have you noticed all the articles on sleep lately? It seems like every day, I see a new story. For years I have been researching how to make my dream bed. You could even say that I was obsessed with trying to figure it out. I didn’t just want comfy, but I wanted to create a place so awesome that I would sleep great and not want to leave. For me, I didn’t have an interest in creating an unbelievable comfy bed based on articles or research or health. My honey and I travel a lot and you know when you get into a luxurious hotel bed that grabs you and loves you and keeps you? Tell me you know what I’m talking about!?! That’s what I’ve been looking for to duplicate at home. Of course, I started my search on the Internet. Where else? I found this story from 2013, How to Make a Luxury Bed, and loved the contrast of the colors. The author doesn’t use a flat sheet and raves about it. Very European. I don’t think I can live without a flat sheet. So I ignored that part. Sheets, pillowcases, duvet, etc. are not cheap. Of course, I’m going to share some saving secrets but still, don’t even start on this until you have saved for it. Or better yet, plan it out and purchase pieces as you go. That being said, if you make getting a good night’s sleep a priority (and it should be! ), you must create a dream bed. After searching on the Internet, I then went into Bed, Bath and Beyond and Tuesday Morning to touch and feel the fabrics. Something sorely missing from the Internet experience. I’m going to be real honest with you. The magic is in the down. Having gone the “Bed-in-a-Bag” route for way too many years since college, I decided it was time to grow up and get a real luxurious dream bed. Thread count doesn’t have anything to do with softness. 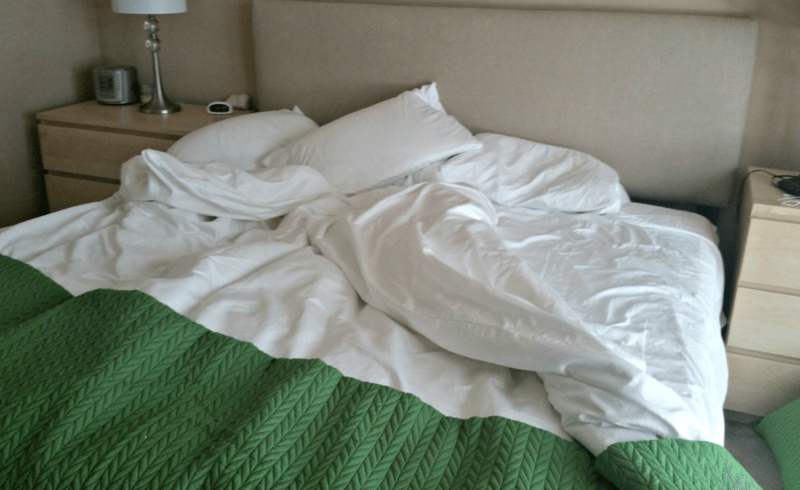 I felt some high thread count sheets that I would never want to sleep on! I always thought that the higher the thread count, the softer the sheet. But no. Beware if buying online. Make sure the reviews say the sheets are soft. Another thing I learned after purchasing the sheets is that I had to buy a gentle detergent and wash AND dry them on the “delicate” cycles. I washed them first with Gain like I do all other loads of laundry but they came out of the dryer feeling rougher than when I started. I thought I had ruined my sheets even before I got to sleep on them! However, I washed and dried them using Woolite and the delicate settings and they were healed! Soft sheets need tender love and care. Now this recommendation is a preference. In fact, it’s not really what is on our bed now. We have a king size bed and have used king size pillows for many years. But do you really need all that pillow? I decided no. I bought 3 standard size down pillows and my honey did not like them at all! He likes his head supported while I like to feel like I’m sleeping on a cloud. He is a fan of the My Pillow (affiliate link) and since I want him to get a great night’s sleep too, I went back to the store and got it for him. We actually have 4 standard size pillows and there is plenty of room for them on our bed. 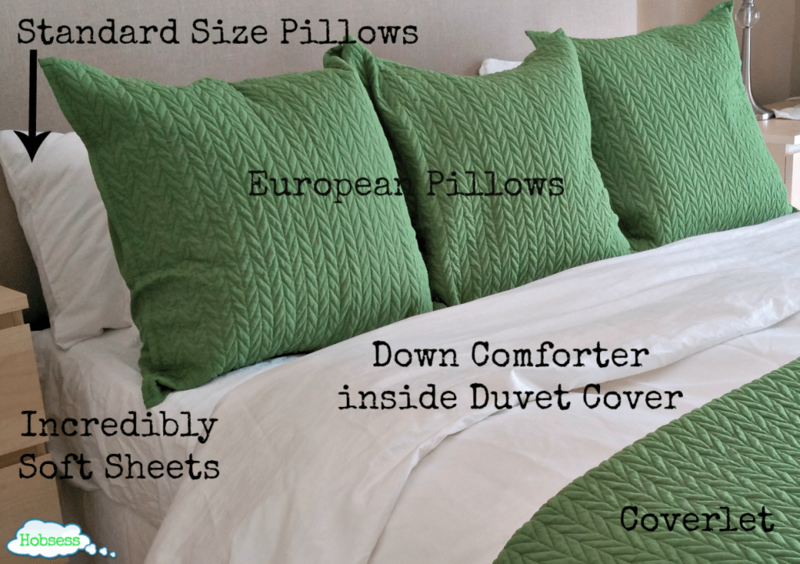 There are so many kinds of down comforters and even a down alternative if you have allergies. I hope you don’t because nothing beats down. You can get a down comforter for warm, cold, or year round (both) OR if you are in midlife, get the one that suits your body temperature. Are you always hot? Get a “cold” comforter and vice versa. We usually have to put an electric blanket on our bed in the winter but we haven’t needed it since we started using the down comforter. I selected the comforter for year round. I figure when menopause hits, I’ll just stick my leg out of the comforter and viola, instant A/C! I had no idea what a duvet was before researching. Think of a duvet like a big pillowcase for the comforter. It comes in many colors, patterns, and textures so it is easy to find one that you like. And since it’s just a cover, it can be easily removed to be washed and dried. The hardest part of having a duvet cover, is putting it on the comforter. That was until I watched this video. Seriously, it changed my life. Another curious term when I began. What is this thing called a coverlet??? A coverlet is nothing more than a quilt-like bedspread that you can use to cover up if the comforter doesn’t keep you warm enough. 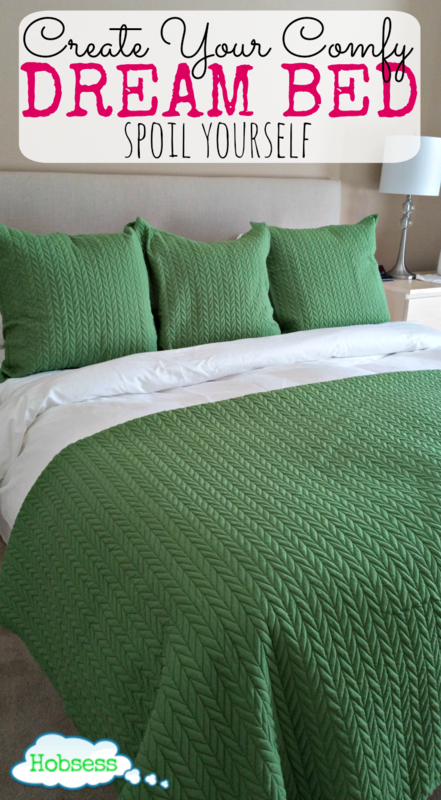 I selected a bright green coverlet to go with my white duvet cover. I love how it looks. I also really liked the way the large square European pillows looked from the article that I mentioned before so I decided to use them as well. We have a padded linen headboard. I like to get in bed to read and lean up against it. Now that I have the European pillows along with the standard pillows, it’s easy to get sleepy just sitting there. So comfy! I also purchased pillow cases to match the coverlet. I preferred to match rather than introduce a third color but you can do what you want. The more you can purchase at IKEA, the better. I would have purchased the duvet cover there but I had already decided on white and they only had a cream color. This would have been a significant savings if I had been more open to IKEA’s options and hadn’t already planned my colors. You can definitely create your own dream bed. If you have the money, I would say get everything as soon as possible. It will change your life. OK, that’s a little dramatic. It will certainly improve your sleep. The other night I couldn’t fall asleep. I had a lot on my mind. But one thought that kept coming in was, I can’t believe how comfortable my bed is! Nodded right off. We didn’t get a new mattress. All we did was change the part that touches our skin. When you hop in every night, does your bed feel so good that it makes you happy? If not, you have to do something about it right away. Today. Let me know below if you have already created your dream bed or if it’s something you are interested in doing. The bed looks amazing! I love the idea. Putting few pillows makes the bed neat and classy. This post inspired me to re-design our bed. Thanks, Sean. And it feels amazing, too. Good luck with your re-design. I love my bed…definitely need to spruce things up as spring comes up! I love your ideas! I do love my bed, but now that I’ve read your blog I think I need a makeover! Especially in the pillow department. And the sheets. And the duvet cover. Really, it looks lovely, Rev, and so inviting. We do have a down comforter – LL Bean of course since I’m a Mainer! I created our dream bed two Christmases ago and my husband had sticker shock until that first night. I don’t think a night has gone by that he hasn’t thanked me and that is priceless. We love it so much that this year we are going to invest in an adjustable bed. We already cannot wait to get to bed at night, I can only imagine how great the new mattress and adjusting is going to be. I haven’t been to Ikea in a while, I need to make the trip. That bed right there looks so comfy! I bought a Temper-Pedic mattress two years ago and it was the best investment I ever made. I also love a good down comforter and soft pillows! Gorgeous bed! These are great tips. I grew up only having two pillow on my bed, and three make such a huge aesthetic difference! Thanks Paige! The 3 pillows I sleep with now are so much more comfortable and the 3 decorative pillows are actually used now instead of just being thrown on the floor every night. Thanks so much for stopping by. Love the information! I love my king size bed. The soft sheets and “just right” pillows help me drift into dream land! I love your spring green and white! Beautiful! Thank you! I really like how the green and white look together. It’r really shocking how soft sheets and the right pillows can improve your sleep. Hi Rev, you’ve inspired me to take action and finally go buy some new sheets! We bought a new mattress last year, and I love it. But my sheets are super old. Thanks so much for all the information. Now I can just go look for those sheets! Wonderful article Revina. My husband has been wanting a down comforter for a long time and now I’m sold! Do it! I can’t believe how much better we sleep because of it. Sweet dreams!